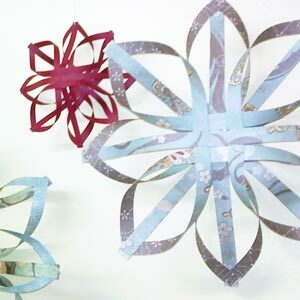 Looking to make your own Christmas decorations to decorate your house with this Christmas? 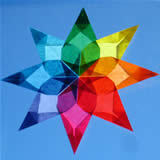 On this page you'll find really simple photo instructions for how to make beautiful window stars. Thanks for sending in your photo Esther! Using your pencil and ruler, draw 8 rectangles on the tissue paper and cut them out. Make each rectangle twice as long as it is wide. Your final star will be twice the height of a rectangle. 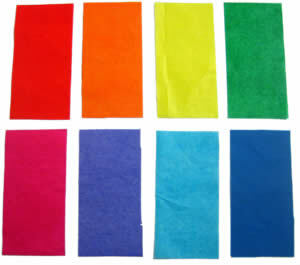 You can use as many or few colours as you like. 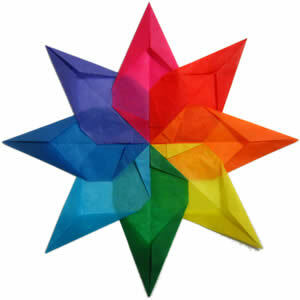 I'll demonstrate with a rainbow coloured star. Pick one of the rectangles. 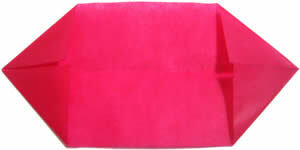 Fold it in half lengthwise, and then unfold again, to leave a crease down the center. 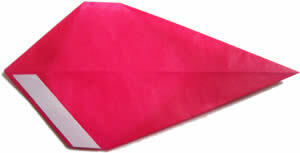 Fold each of the corners to meet the center line. 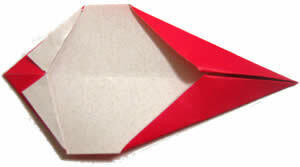 On the right, fold the two edges in to meet the center line again, like you were making a paper plane. 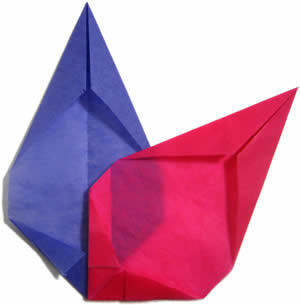 On the left, fold the corners so they look like this. These little folds will make a pretty "star within a star" effect later on. 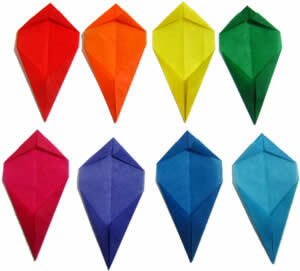 Fold all the other pieces the same way. Turn one of the pieces over, and put a strip of double-sided tape on it like this. I've left the backing on my tape so that you can see it clearly, but obviously you should peel the backing off yours. Place the piece on top of another piece, like this. Notice that the taped edge on the pink piece lines up with the center-line on the blue piece. 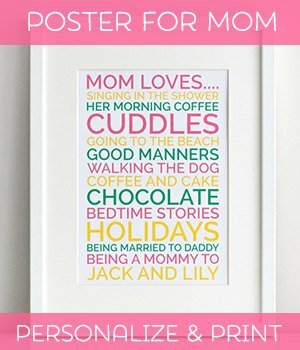 Add the rest of pieces in the same way. 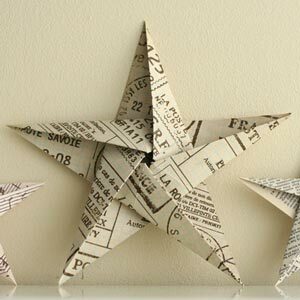 Finally, you'll need to complete the star by taping the first and last pieces together. 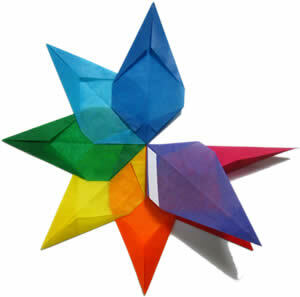 The easiest way is to fold back the star like this, put some tape on, then fold it back down. The finished star! You can flatten it in a book for a few hours to set the creases. 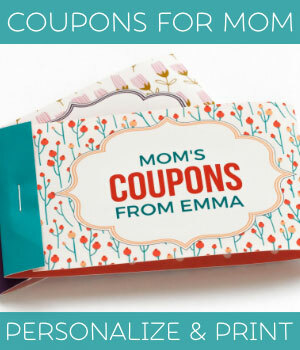 Because these pack flat, they're great for sending as gifts inside Christmas cards . 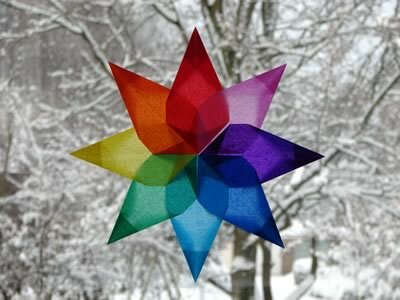 To attach your star to a window, use a tiny dab of glue-stick. If you use too much, it will be impossible to remove the star without tearing it. 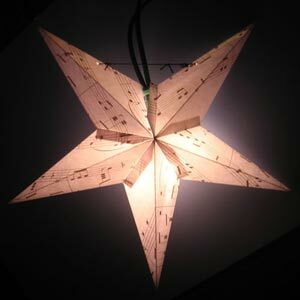 Instead of using glue, you can also attach a hanging thread to one point of the star. Looking for more Christmas Decorations?